Looking to Master All Grain Brewing? Want to make the leap from extract to All-Grain brewing? Would you rather watch it done than read a book? 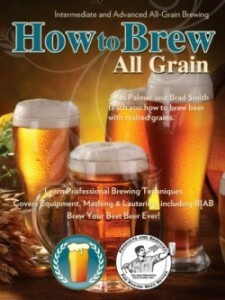 How to Brew All-Grain teaches you how to brew with malted grains, and covers everything from selecting your equipment to brewing, bottling, and kegging. Featuring many hundreds of shots showing every single step in the process. It joins our already released How to Brew with Malt Extract video for beginners. Order the Digital Version on Vimeo Now or Get the Physical DVD on Amazon – shipping now! Order the Digital Version on Vimeo Now or Get the Physical DVD on Amazon! Featuring two of the best known authors in the brewing community, John Palmer and Brad Smith have together over 50 years of brewing experience. This video was personally scripted by John and Brad, who they carefully set up, lit and shot over 3,5000 shots and then distilled them down to create this video and the companion How to Brew with Malt Extract. John Palmer is the best-selling author of How To Brew, Brewing Classic Styles, and Water from Brewer’s Publications. He is the owner of Palmer Brewing Solutions Inc. – a consulting and product development company at HowToBrew.com, dedicated to making beer better. We are shipping DVDs now to home brewing shops for resale. Check out our wholesale page if you are a brewing retailer interested in selling our DVDs or BeerSmith on CD. Dear Brad, I bought the DVD the very morning it became available and I liked it very much. However, may I suggest an improvement? Actually, such a DVD is a reference work the brewer will commonly use, before and during the brewing sessions. A kind of textual “table of contents” would be most useful: for instance, such matter is addressed at the 32nd minute. Of course, I can build such a ToC for my own purpose, but this is the kind of information one may expect to accompany the movie. Thanks! I do have it set up so you can access sections from the DVD menu, but I do appreciate the suggestion. Once we run through this set of DVDs I’ll see what it would take to include an insert in the next run.